We speak with the director and stars of The Mountaintop. We speak with the director and stars of The Mountaintop. 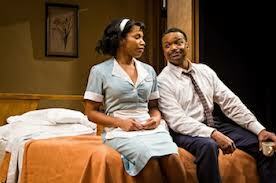 The Mountaintop is a play about the last night of Martin Luther King Jr.’s life, and imagines a conversation between King and a maid named Camae in the Lorraine Hotel. We’re joined by Centerstage Artistic Director and director of The Mountaintop Kwame Kwei-Armah and the play’s stars, Shawn Hamilton and Myxolydia Tyler.